A sort of homecoming occurred in Galax, Virginia for Wild Ponies. East Nashville-based bandmembers, Doug and Telisha Williams, brought friends from Music City (Fats Kaplin, Will Kimbrough, Neilson Hubbard and Audrey Spillman) along for the ride as they made the trek to Southwest Virginia. Doug and Telisha grew up near Galax, the mountain town that their recent album release takes as its name. The Nashville pickers partnered with local Old-Time players (Snake Smith, Kyle Dean Smith, and Kilby Spencer), who had spent time playing with Doug’s grandad, to make a record. Recorded in a shed that stood behind the family farm in the Appalachians the sounds of wood creaking blends with the chirps of the insects outside the walls, the ambient sounds as much a part of Galax as the quality of the performance. For the recording, the players sat in a circle, capturing the songs without the ability for playbacks, no one really knowing what the sessions had produced until they returned to Nashville. Wild Ponies return to their Roots, both musical and geographic, on Galax. Opening the album, the traditional mountain song “Sally Anne” jumps in to start heels kicking as the players give a nod to Hazel Dickens on her tune “Pretty Bird”. Though leaning heavily on acoustics, Galax does not blanketly honor the traditions of Mountain music, Doug points out that ‘we didn't want to go home to Virginia and just make an Old-Time record. We wanted to make something that still sounded like Wild Ponies. We asked everybody to stretch and reach towards something new, something different. We wanted to not only reconnect with our roots, but learn how those roots can also weave into our current world’. Wild Ponies go to their own musical catalog for “Hearts and Bones” as well as “Tower and the Wheel” as they borrow a cut from Jon Byrd with “Jackknife”. A shuffling rattle grounds the groove for “Will They Still Know Me” and a Country ramble bids “Goodnight Partner” as a darkness adds an edge for “To My Grave” and a 70-year old bound leather notebook from Doug’s grandfather gives its words to “Here with Me”. 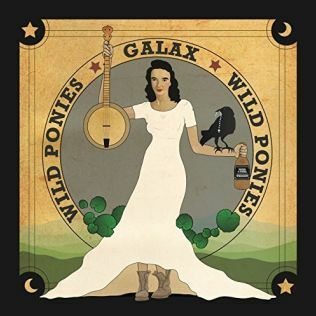 Wild Ponies form a bridge between musical eras on Galax, with Telisha Williams seeing the link a natural event for the band as she notes that ‘We'll always be the pinball that bounces between folk, rock’n’roll and country and this Old-Time style will always weave its way through everything we do. It's been there from the start, even on the loudest songs we've made. It only took us a couple of days to record it, but this is the album we've been making our whole lives. We just needed the right people and the right songs to finish it’.